Established in 1972, the Donut Man sits on a stretch of Route 66 in Glendora, California, east of LA. The shop is 24 hours (!) which means they are making doughnuts ALL DAY LONG. Now that's my kind of place. 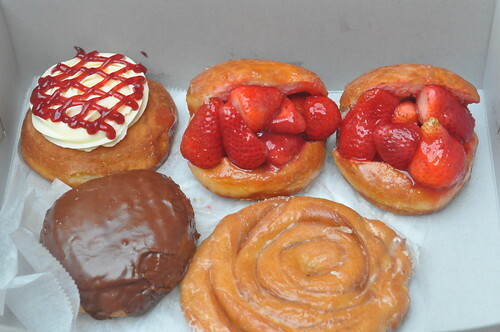 Their specialties are fresh fruit filled donuts which come in strawberry and peach and consist of a nearly bisected glazed doughnut that's stuffed sandwich-style with glazed lightly glazed fresh fruit. They're only served in season and alas the peach were already done for the year. But I lucked out that the strawberry donuts were still around as their season is ending soon. 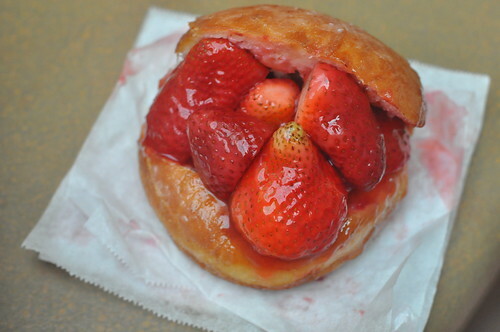 Since California is a mega strawberry producer you can get the strawberry doughnuts from late January until October. Whew. I'm glad I didn't miss out because, a fresh fruit-filled doughnut sandwich is an awesome, awesome idea--it's one of those things that makes you think, why don't I see these everywhere?! I highly recommend making a pit stop if your travels take you near LA, especially if strawberries are in season. 915 E Route 66, Glendora, CA.